In this image, the New Dam in being created in front of the Old Dam. There are men standing on top of the New Dam, some working, some talking amongst themselves. The Connecticut River can be seen running from the Old Dam and underneath the New Dam. Scattered around the ground are barrels and blocks of stone. 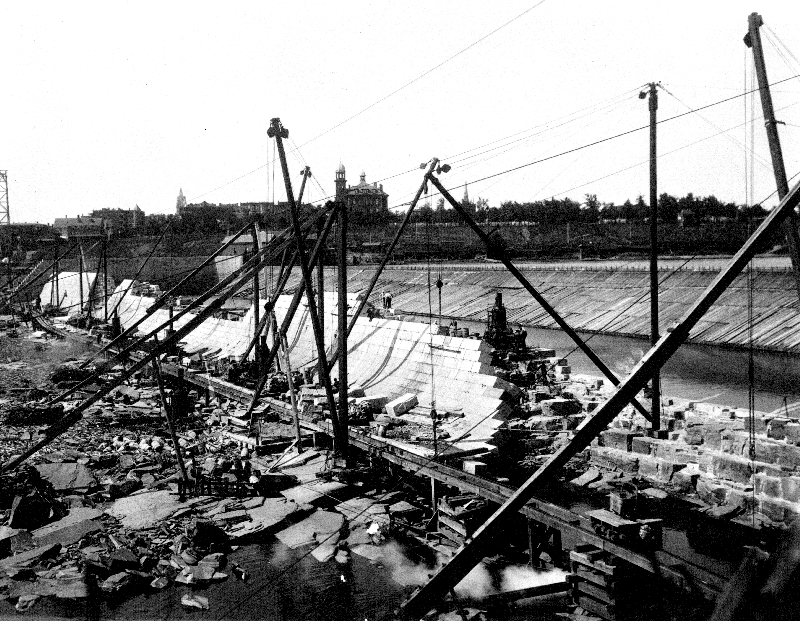 "Construction of the New Dam," in Creating Holyoke, Item #13, http://creatingholyoke.org/items/show/13 (accessed April 18, 2019). This digital file may be used for educational uses, as long as it is not altered in any way and proper recognition is given in citation. Prior written permission is required for any other use of the digital files from the Holyoke Public Library History Room & Archive.